I really discovered this band during a concert last autumn. And for the first time at a concert, I must admit that I received a monumental slap… Madrid was the support for Labradford, but when the four members began their show, I didn’t even know their name. If I had never seen the faces of the members of Labradford, I could willingly think, during the listening of the first song, that Madrid was Labradford. Not only their music – atmospheric ambience like the best of American Post-rock productions – but also the musical affection was close to Labradford. 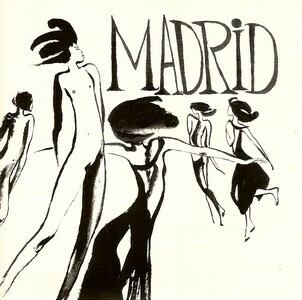 It was all clear: I had to buy the album on which Madrid is caught playing live, in a cathedral silence. Madrid (ex-Astro Boy) is from Grenoble, and was founded in September 1996 by Joël and Guilhem. From the beginning their music has taken a different way than classical ‘pop-songs’ with the traditional ‘verses+choruses’. It’s rather a matter of musical loops on the basis of keyboards. Their first work ended up as a 7 track demo called After Lunch, listed by the specialized musical press. From this point on everything got moving. First, the discovery of new views with the success of bands like Labradford and Tortoise, then the arrival of a new musician, Dom, who particularly appreciates jazz and rap, and at last the use of a sampler. All this resulted in a ‘real’ first album called Night Clubber. It’s one of the first French post-rock albums. Made up of 7 tracks, like the first demo, it gives the band status as the French hope of this musical genre. Their universe is atmospheric, like something in-between the best of Labradford (Portamento Road and Westcross Weet) and of Tortoise (Gemini, Here Comes The Wonderful Electric Drummer, and Don’t Expose), with a touch of Drum’n’bass (Mapeo and External Tone), and the music is mainly instrumental. Only a few murmurs trouble the very quiet sound loops, or even the arrowing sound loops. This relative calmness is sparsely disturbed by a noisy guitar, particularly in the middle of the excellent Westcross Weet (with such a live sound!). In short, a musical top. FR Un bébé qui fête son premier anniversaire est encore un bébé, un blog qui fête son premier anniversaire est déjà un vieux blog. J’ai du mal à croire que je suis encore là un an plus tard, à construire patiemment une collection de disques virtuelle… En un an, on compte plus de 250 disques proposés, avec beaucoup de ‘recommandé’, pas mal de ‘highly recommanded’ aussi, mais seulement une poignée de titres ‘extremely chaudement super highly recommanded’, auxquels on ajoutera ce Night Clubber, authentique trésor perdu et disque de chevet personnel. Madrid n’a sorti que deux albums (celui-ci et un second sur Ici d’Ailleurs, plus acoustique, moins nocturne), aujourd’hui on retrouve Guilhem Granier sur Arbouse sous le nom de Thousand & Bramier, et Serpentine est devenu le plus expérimental (mais toujours grenoblois) Universinternational. C’est un premier effort, ce n’est donc pas parfait, mais c’est un disque auquel je tiens tout particulièrement, donc c’est extrêmement chaudement fortement très très très recommandé (suis-je assez clair?). ENG A one year old baby is still a baby, a one year old blog is already an old blog. I can hardly believe I’m still here one year later, patiently building a virtual record collection… Anyway, here’s an all-times favourite to celebrate, a forgotten classic and a true lost gem (really). Madrid made only two albums (this one and a second on Ici d’Ailleurs), Guilhem Granier is now Thousand & Bramier on Arbouse Recordings, and Serpentine turned into the more experimental Universinternational. Extremely seriously strongly highly recommanded (am I clear enough?). Cet article, publié dans Ambient, Post-Rock, est tagué Madrid, Serpentine. Ajoutez ce permalien à vos favoris.